I'm one of those people who likes to have everything on hand at all times, which means my purse (or black hole, as it's jokingly referred to) weighs pretty close to a small child. I've tried to tone things down recently as I've started carrying smaller bags to bring only the necessities with me. 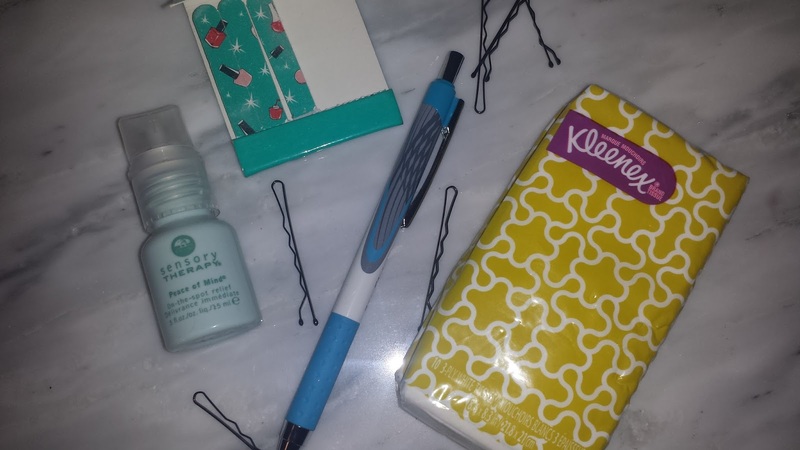 These are the things I consider my essentials. 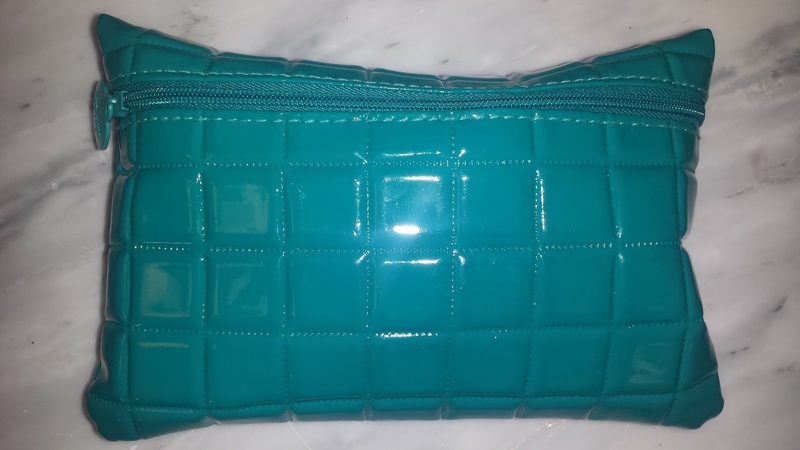 I keep all my products in an Ipsy bag so I can easily move it from one purse to another and nothing gets lost. It's a simple way to keep everything I need all in one place. Lip products: As a girl who loves her lipstick I always keep what I consider to be a neutral shade on hand in case I forget to put lipstick on that day or I've managed to misplace the one I've brought. 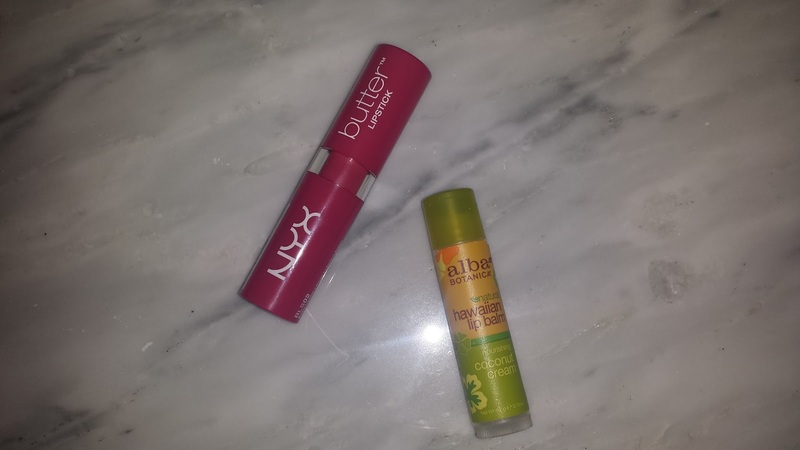 I also always keep a chapstick on hand; currently I've been using the Alba Botanics lip balm in coconut cream and it's really good! 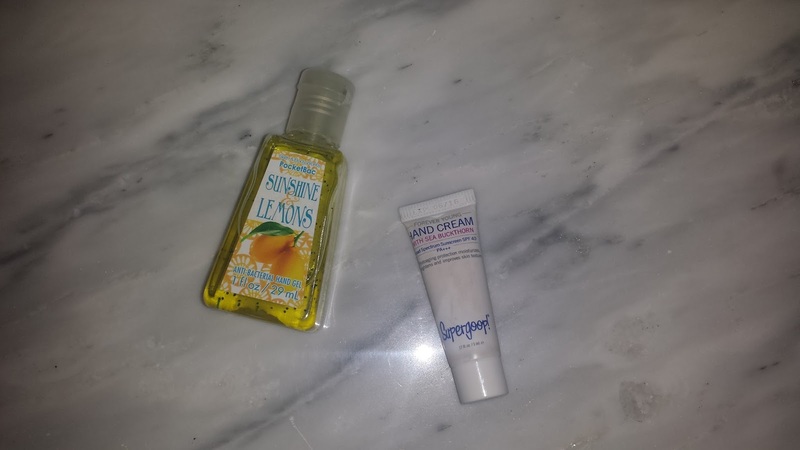 Hand products: I always have an antibacterial gel with me and this one is in Sunshine and Lemons, the perfect scent for summer. The hand cream I'm carrying is a Supergoop one with Sea Buckthorn and SPF 40. It's not my favorite, but it's a convenient size and easy to throw on after I wash my hands. Beauty tools: I love this retractable elf kabuki brush, it makes touching up my powder super easy and mess free. I always have a set of spare tweezers on me and it's come in handy on many occasions. 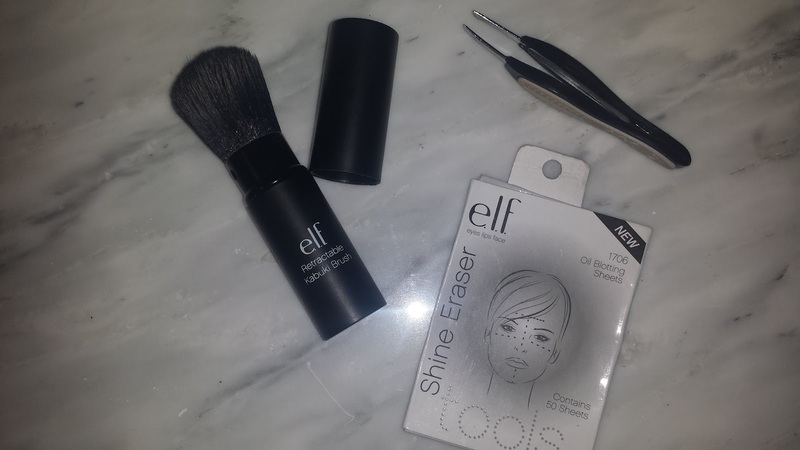 The elf shine eraser papers are a must for me as I am ridiculously oily. These work as well as any other blotting papers I've used and they're only $1. 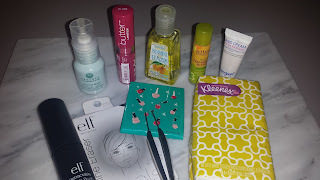 Miscellaneous: I love the tear out nail files in this little pack, I am always breaking a nail and snagging it on everything so these are super handy. 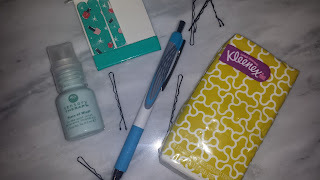 The Kleenex is self-explanatory and a total lifesaver, the same can be said for the bobby pins. My sensory therapy on-the-spot relief oil in mint is one of my favorite products. If I ever have a headache I massage a little onto my temples and the back of my neck and I feel instant relief, it's sooo good. Lastly, who doesn't always need to have a pen handy? That's everything I consider to be my handbag essentials. Tell me what's a must-carry in your bag! I love this Kim, what a smart idea to move everything from one bag to another. Brilliant! OK, you're going to laugh but there's another essential that I carry with me, and that is a bag of nuts, almonds, peanuts or cashews, something to give me a little protein if I'm not near any food for a while. And I always have my powder compact, and a little pill case with ibuprofen. I also carry one of my eyeliners, as my one eye has a tendency to get watery so if it smudges off I'm ready to reapply! I hope you have a beautiful, productive, and peaceful Wednesday beautiful girl!